The story of this building begins in the nineteenth century with the people who built it: the Oddfellows. The Hand-and-Heart Lodge, Manchester Unity Independent Order of Oddfellows, was founded in 1848 and was the first of the ‘friendly society’ lodges in Otago. By 1882 there were 127 Manchester Unity lodges throughout New Zealand. They provided financial benefits and social services to affiliated families and individuals, and filled an important role in their communities in the days before the welfare state and modern health and life insurance systems. They also organised social activities for their members. The origins of the Oddfellows can be traced to the English guild system, when members of trades without enough fellows to form their own guild joined together to form mixed guilds: the odd fellows. Manchester Unity was one of many manifestations of the movement and was formed when members seceded from the Patriotic Order of Oddfellows in 1813. This building (in its original form) was built between September 1882 and January 1883, following the expiry of the lease on the lodge’s previous hall in George Street. There was much ceremony for the laying of the foundation stone, with a procession headed by Krull’s brass band, speeches read from a specially erected platform, and children singing the New Zealand anthem. Newspaper reports referred to the architecture as ‘classic style’, however, it would be more accurate to describe the building as a palazzo in the Renaissance revival style. It was constructed in stone and brick with a cement-rendered façade and corrugated iron roof. The façade decoration included pilasters with Corinthian capitals, window pediments, a dentil cornice, a balustraded parapet, and finials. Francis Wilkinson (1834-1902) was the builder and the contract price was £2,825. Edmund Martin Roach (1835-1912) was the architect. Born in Islington, London, Roach began his career as a contractor and had been Inspector of Works to the Otago Provincial Government before joining the practice of architect David Ross. Roach’s most familiar designs are the Baptist halls in Hanover Street and Primitive Methodist Church buildings (built in two stages) in Dundas Street. 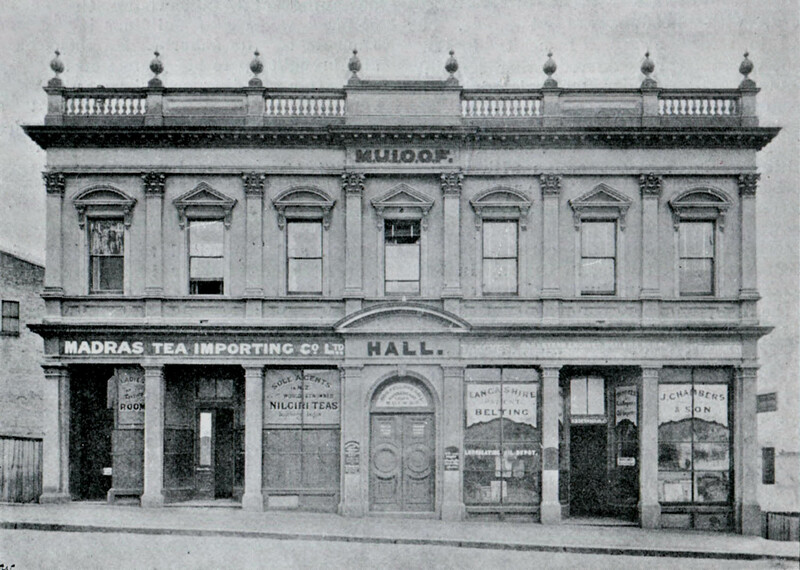 The building as it appeared around the turn of the twentieth century, with the shop of the Madras Tea Importing Co. Ltd on the left, and John Chambers & Son (engineers and importers) on the right (Cyclopedia of New Zealand). As the ‘mother lodge’ the Hand-and-Heart Lodge provided facilities for the wider Oddfellows community, as well as to many other groups, including Masons, Druids, Foresters, the Gaelic Society, the Disciples of Christ, the Rationalist Church, and the Theosophical Society. Activities included meetings, socials, concerts, lectures, dancing classes, cooking classes, and election meetings. The building also contained shops fronting Stuart Street. Between 1932 and 1933 the building was extended and remodelled to designs by architects Mandeno & Fraser at a cost of between £6,000 and £7,000. With rearward additions it may have as much as doubled in size. The building contractor was Alfred Edward Silver (1878-1960) and the decorator Edwin Longworth. Many features of the original façade decoration were retained, including four of the eight first-floor pilasters with Corinthian capitals, five of the seven window pediments, and part of the cornice. The finials and balustraded parapet were entirely removed. 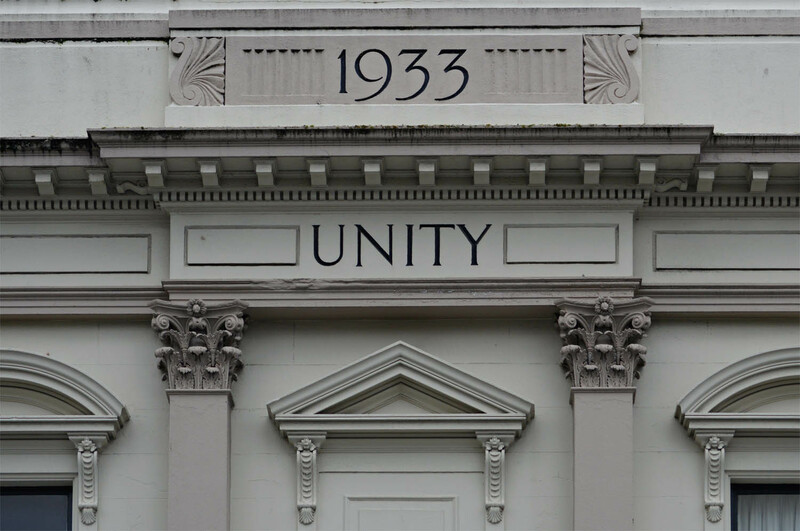 Art deco detailing was added, including the name of the building (‘Manchester Unity Chambers’) and the date of reconstruction (‘1933’). A hanging verandah was added and new shopfronts included brown and orange ceramic tiles and lead-lighted windows. The extensive additions included a new meeting hall on the second floor, the roof of which is the highest point of the structure. It was remarked that the reconstruction was a major building project in Dunedin during a time of economic depression. The facade is an example of the widespread facelifting of Victorian and Edwardian buildings in the art deco and stripped classical styles. In Dunedin, this particular brand of’ ‘remodelling’ began around 1929 (Allbell Chambers), and continued through the 1930s and 1940s, with examples including the City Hotel (1936-1937), Harris Shoes (1939), NMA (1940), UFS (1940), and Paterson & Barr (1948). One of the last decorative examples was the Hotel Central (1953). From the 1940s onwards these facelifts tended to become more crude and simple, and by the 1950s-1970s they were usually a fairly brutal treatment involving the removal of any ornament and a flush cemented finish (e.g. the Standard Building and the Atheneum). When looking at these buildings the overall proportions and the retention of old sash windows are often a giveaway. Why do it? It was sometimes a solution to maintenance problems (e.g. crumbling stone balustrades) but it was also a reaction against unfashionable Victorian architecture, and a way to make a building appear more modern. I’ve seen one building report from the period which recommends one of these facelifts as an inexpensive way to significantly increase the building value. My personal view is that it’s shame that so many of our Victorian buildings now look so disfigured and confused, but they do give a building an interesting layered history and some of the best examples work well and are quite delightful. The Manchester Unity Chambers are particularly appealing, and unusual in the way they have retained some of the old decorative detail. The Lodge relocated to the Glasgow Street Friendly Society Rooms in 2007, having sold the building some years earlier. 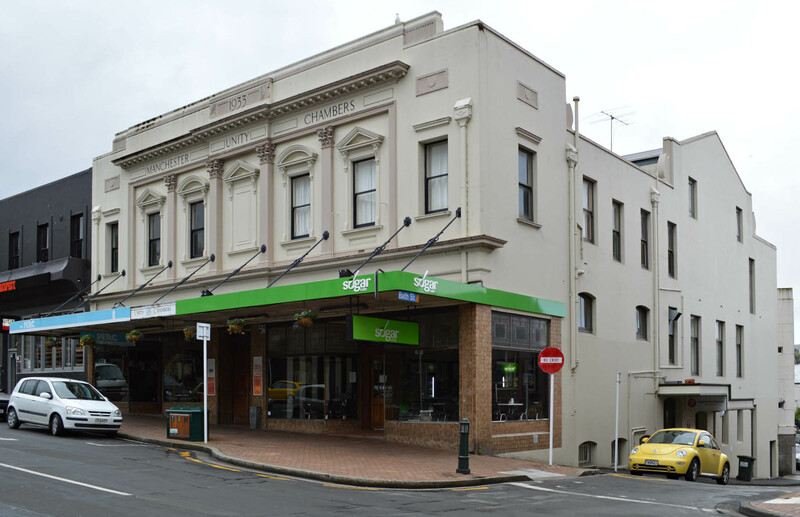 It disbanded in 2012, by which time it was known as the Otago Friendly Society. The corner shop was occupied by Eclipse Radio from 1939 to 1993. Something of a local institution, over time it added televisions, model supplies, and computers to its business. The upper shop has been home to The Perc (originally The Percolator) cafe since 1992 and another cafe, Sugar, now occupies the corner shop. With their unspoilt tile-work and leadlights they have two of the best preserved 1930s shopfronts in Dunedin. The many occupants of the offices have included insurance agents, accountants, solicitors, dressmakers, music teachers, incorporated societies, and currently the Zuma web and design studio. Hopefully, the future of the building will be as colourful as its past. 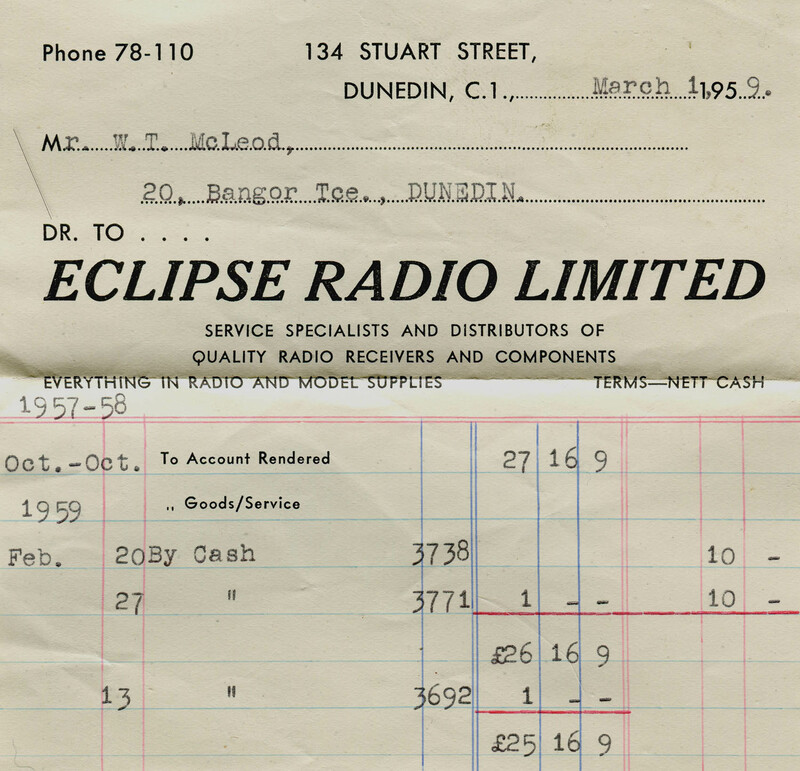 Eclipse Radio ephemera addressed to my grandfather. Newspaper references: Otago Daily Times, 9 May 1882 p.2 (description), 12 May 1882 p.1 (call for tenders), 25 September 1882 pp.2-3 (description and laying of foundation stone), 24 January 1883 p.2 (hall used for first time), 21 July 1933 p.10 (opening ceremony for reconstructed building), 13 February 1993 p.3 (closure of Eclipse Radio and Computers), 30 April 2007 p.4 (relocation of Unity Otago Lodge), 21 July 2012 p.1 (Otago Friendly Society disbanded); The Star, 14 June 2007 p.19 (re-opening of The Perc). Other references: Cyclopedia of New Zealand, vol.4 (Otago and Southland Provincial Districts, pp.289-90); plans for alterations, Dunedin City Council records. This entry was posted in Buildings and tagged 1880s, 1930s, A.E. Silver, Art deco, Eclipse Radio, Edmund Roach, Facelifts, Francis Wilkinson, Lodges, Manchester Unity, Mandeno & Fraser, Renaissance revival, Stuart Street, The Perc, Victorian on 26 November 2012 by David Murray.